Discovered by William Herschel in 1784. NGC 3628 forms a conspicuous group with M65 and M66, the Leo Triplet or M66 group (named after the brightest of the three). NGC 3628 is the faintest and most difficult in the group, just faint enough to have escaped Messier's small telescopes (although it may be that his later instruments might have shown it, if he had ever looked at this place under very good conditions). Thus its discovery was left to William Herschel who cataloged it as H V.8 following its discovery on April 8, 1784. NGC 3628 is seen edge-on. A conspicuous band of dark dust clouds form a broad equatorial band, which obscures the galaxy's bright central region, and hides most of the bright young stars in its spiral arms. The dust band, or belt, is obviously distorted and deformed in the outer regions of the galaxy. The reason for this deformation is evidently the gravitational interaction with its two bright neighbors, M65 and M66. 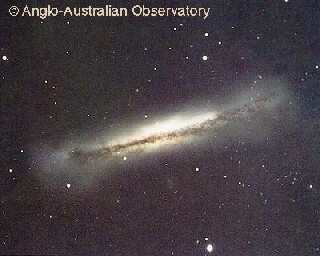 Our image was obtained by David Malin with the Anglo-Australian Telescope. This image is copyrighted and may be used for private purpose only. For any other kind of use, including internet mirroring and storing on CD-ROM, please contact the Photo Permissions Department (photo at aaoepp.aao.gov.au) of the Anglo Australian Observatory. In the SAC 110 best NGC object list. In the RASC's Finest N.G.C. Objects Objects list.